Credit and debt can be a stressful topic. When people borrow money they assume they can pay back, and then don't get the increase in income they were expecting, or experience a change in their financial situation that leaves them broke. 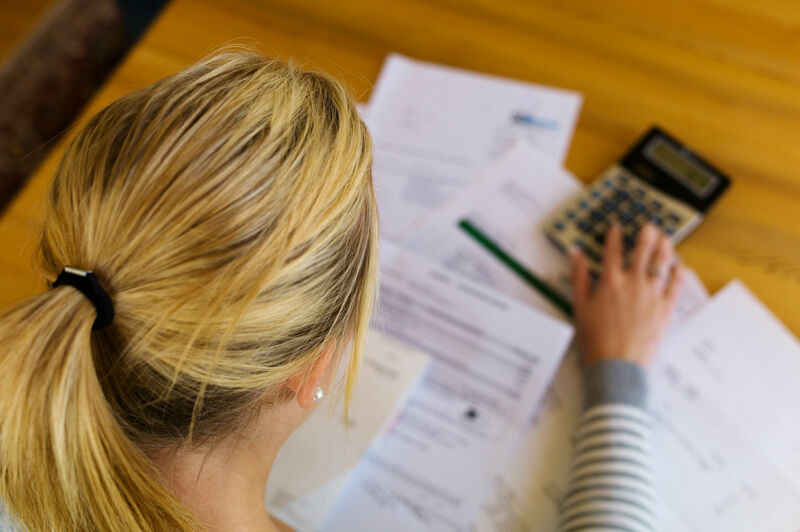 It can be tough to face up to debt, but following these ten steps, you can make it out of debt and back into savings. The first thing to do is to properly review your finances. Ignoring mounting debt won't get you anywhere and debt collectors can't be fobbed off forever. You have to know the size of it and plan a route to conquer it. Unpaid debt can harm your credit rating and affect your ability to borrow money, hire cars, rent property etc. You might already have a good idea of who you owe money to but it can't hurt to get a credit report. There are a few companies in the UK who offer a free credit report for 30 days. Make sure you cancel your account before the trial period is up. Put together a list of everywhere you owe money, how much you owe, and the interest rates of each. You should aim to pay at least the minimum amount each month for each debt then prioritise the debt with the highest interest rate. Budgeting can seem like a mammoth task but it's really quite simple especially when using a budget planner like Money Dashboard. The Cashflow Calculator feature can be used to anticipate your monthly outgoings and repayments. Once you know your total income for the month and the amount you must pay back you can see how much you have left each month. You can set yourself monthly limits for other expenditures using the Spend Tracker feature. If your minimum repayments and monthly outgoings are more than your monthly income start by reviewing your spending. Price comparison websites can help you make sure you're getting the best deals on utilities, telecommunications, and insurance. Often you get better deals for paying by direct debit. See if there's a way to save money on transport with travel cards or booking an advance or on groceries by choosing own brand alternatives. Cut your indulgences down to a bare minimum. The Outgoings Chart on your Money Dashboard can also help identify areas where you may be spending more than you think. You may find that you are paying more interest on your debt than you need to. You might be entitled to a 0% credit card or other credit sources that have a lower interest rate. You can also speak to a debt consolidation company about combining your bills. They should be able to offer you a lower monthly repayment. This means you will be paying them back for much longer and paying more overall, but you will be able to afford the repayments. This may seem obvious but it's important. If you make your budget too tight you will overspend. Keep it realistic and if you can't stay within the limits you set for yourself don't give up. Adjust them and try again. Using Money Dashboard as a budget calculator can be really helpful in making sure you don't miss anything. Get rid of store credit cards as they tend to have very high interest rates. Unless you are transferring debt to a credit card with a smaller interest rate you shouldn't be using credit cards anymore. Cut them up and throw them out so you are not tempted. Do not accept any new loans or credit offers unless you are paying back more than you can manage and need to consolidate. Letters from debt collectors often use powerful language to scare debtors into complying. Remember that they are just following protocol and anyone you talk to will be receptive to discussing options for gradual repayment. If you feel like you are being unduly pressured, if rates have been unfairly increased or unfair charges have been added, speak to the Financial Conduct Authority, Financial Ombudsman Service, or the Office of Fair Trading. Writing a letter or email is good because you have a record of the conversation with the lender but a phone call will work just as well especially if you make note of when you called, the person you spoke to, and what was agreed. A bit of advanced research can't hurt either - look for personal finance forums that discuss your creditor or the debt collection agency and try to find out what their usual tactics are, how ethical or understanding they are and what kind of deals they are likely to accept. Explain your financial situation and tell them how much you can afford to pay monthly. They may ask you to provide proof so be prepared to share your financial documents with them. Even if the monthly amount you offer is less than they requested you may be able to agree on a repayment plan, though you will likely have to pay them for a longer period and a larger total amount. If you can pay the debt off faster than they were expecting you may be able to agree a reduced rate and save some money. If you are still not sure what to do or have questions that aren't answered here, there are organisations where you can get professional assistance. Contact the Citizens Advice Bureau or free services like National Debtline. Try to be open with family and friends as well. Debt problems can lead to mental health problems and being open rather than embarrassed may earn you some emotional support and understanding.